"… a 2600+ Grandmaster can and will defeat a less sophisticated opposition with apparent ease. There's nothing mysterious about his ability to keep flow of the game under control simply, because he operates from a position of superior knowledge and hardly has to take any non-linear decisions - junctions where he might go wrong -- until his technique can take over." Each GM has his own story and Maurice Ashley certainly has his own! 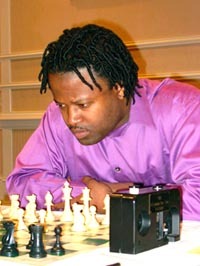 In a September 2nd phone conversation with The Chess Drum's Daaim Shabazz, the Brooklyn-based GM discussed his view of what it means to be a GM, some of the thought processes, preparation methods, overall approach to the game and advice for players seeking to raise their level of play. Although GM Ashley flatly rejects the notion of a "GM mystique," he speaks with great passion about chess and sees it as an ultimate challenge. When asked what it takes to actually to break the barrier of becoming Grandmaster, GM Ashley provides us with some very interesting answers. While originally planned for the usual 65th Square essay, The Chess Drum presents the actual conversation here. Enjoy! GM Maurice Ashley intensely focused and on the mark. Click to download Windows Media Player or Real Media Player, if needed.